These two photographs show scenes from the Ottawa Chautauqua Assembly of 1886. 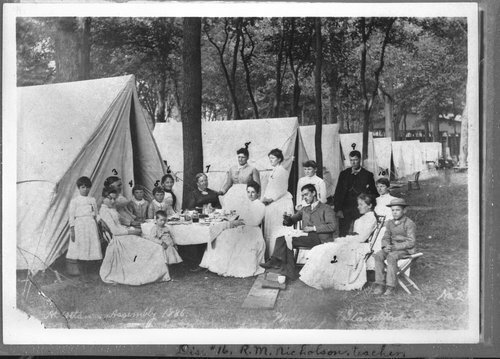 The first image shows a gathering at the Ottawa Chautauqua in Forest Park. The second image shows Civil War General John A. Logan (left), who passed away December 26, 1886. While not a Kansan, Logan was quite active in the GAR and frequently, attended GAR functions at Chautauquas. Logan is credited with setting Memorial Day as an annual day of observance, although he's not responsible for the first Memorial Day.